driver allowances, parking, permit and taxes, with 3 Lunch at Rameswaram, Kanyakumari and Kodaikannal. After lunch at starting to Madurai, check in over night stay at Madurai. Evening drop at Kodaikannal bus stop, starting to Chennai by bus. As you arrive at the airport (Chennai), one of our trained representatives will assist you to reach one of the pre booked hotels. Your journey becomes comfortable right from the very first moment as you will escorted in AC car/coach. Get ready for that unprecedented warmth whereby you get enthralled by traditional Indian welcome by the female staff of the hotel. Have breakfast in your room and relax before starting our city tour next day. As we finish our breakfast, we move on for Chennai sightseeing tour. We make you visit Fort St. George of 1639, St. Mary's Church, and Museum & Wellesley House. You also earn an opportunity to witness the San Thome Cathedral, one of the sacred places meant especially for the Catholic Christians. We also make you explore the Museums representing the collection of Chola bronze & stone sculptures belonging to the Deccan era. We later take you to Mahabalipuram, revered as a World Heritage site. We include prominent places such as Arjuna's Penance, Shore Temple, five Rathasshrine, which are recognized for their antiquity going back to the reign of King Mahendravarman. Later on, we take you the temple town 'Kanchipuram', located on the Palar River, which is recognized for its gorgeous temples & silk sarees. Overnight stay is planned in one of the hotels of Mahabalipuram. This day is dedicated especially to witness the beauty of Pondicherry. As it stays nearly 170 km from Chennai to Pondicherry, we check in at the hotel to get refreshed. In the afternoon as we take our lunch, we go for a half day sightseeing tour of the city. We then drive to Aurobindo ashram and witness many more attractions of the city. Staying overnight at the hotel is on charts. After enjoying our breakfast, we begin our journey from Pondicherry to Swami Mailer ethnic Village Resort. We also make you interact with prominent places such as Chidambram and Gangaikonda Cholapuram. The distance involved goes nearly to 166 Km. Staying overnight in one of the hotels is planned. On this day, we make you witness the glorious Swami Malai-Tanjore-Trichy, that is nearly 91 KM away. We take you on a morning drive to Trichy. Trichy is a beautiful island, located in Srirangam. As it is engulfed by by the Kaveri water, this 600 acre island town enthralls even the keenest travelers. There is a gigantic Sri Ranganathaswami temple as well. We also make you visit en-route the beautiful Tanjore Temple. Thanjavur is recognized for the famous Brahadeeswarar Temple. It was a thousand years ago when this temple came into existence by the Chola King Raja Rajan. Not confining to that, the Art Gallery and the Saraswathi Mahal Library also remain on the charts. As you arrive Trichy, we make you check-in at the hotel. As we take some rest, we also make you visit Srirangam and Rock Fort. This is the day when we take you to Madurai. Sightseeing tour of Madurai is equated with the Athens of the East. Revered as one of the oldest cities of India, its history dates back to the Sangam period of the pre Christian era. The city is believed to be more than 2500 years old. The glory of Madurai has not been diminished as it returns in the earlier part of this millennium. As it later came under the rule of the Vijayanagar kingdom, it was ransacked by the ravaging armies of Delhi lead by Malik Kafur. As you witness the beauty of this temple, you will find that the sculpted pillars tell the story of the beautiful princess of Madurai and her marriage to Lord Shiva. Afternoon is kept for leisure, which is followed by an overnight stay at one of the pre-booked deluxe / luxury hotels. This is the day when we, after finishing our breakfast, begin our journey in leisure. In fact, the day trip to visit Rameshwaram or Kodaikanal remains optional. One of the fascinating hill stations, it proudly stands amidst sylvan beauty on the southern crest of the upper Palani Hills. Going back to its history, we find that it has been founded by one of the American missionaries in the year 1845. With its beautiful rocks, woods, lovely lake and bracing air, the atmosphere become charged like never before. As Kodaikanal is an ideal hill destination, its beauty is indomitable. You will enjoy its every bit. Overnight at the hotel is planned. As you finish your breakfast, we take you to Kanya Kumari (Cape Comorin). This place constitutes the last end of India where three Oceans meet. We also take you to the Kumariamman temple, which is dedicated to the virgin goddess Kanyakumari (Parvati) who stands guard over the country. As this place is beautiful, it is surrounded by beautiful beaches and constitutes one of the recognized pilgrimages of India. You can enjoy a dip in the ocean, which is revered for its holiness. However, the sea is not fit for bathing purpose. You can watch sunset and moonrise at the same time on a full moon day. Continue to Kovalam and on arrival, stay for overnight in your pre-booked Deluxe / Luxury hotel. 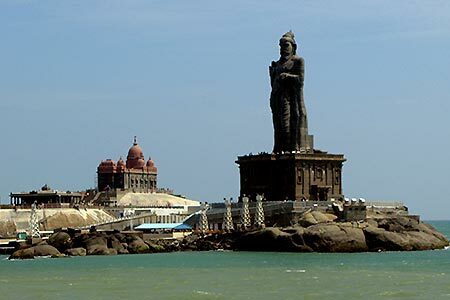 Described as the southernmost end of Tamil Nadu, the lands end of India or the point where the three seas meet, enchanting Kanniyakumari or Cape Comorin is one of the most popular tourist spots in the state and indeed, in the country. Part of the fascination is of course the fact that it is the very tip of the Indian peninsula and the confluence of the Bay of Bengal, the Arabian Sea and the Indian Ocean. The other part is that the nature is so spectacular at Kanniyakumari, that several other Indian beaches pale by comparison. Cape Comorin is at its best during Chitra Pournami (full moon day in April) when the sun and moon are face to face at the same horizon but other full moon days are also special when you can see the sun set and the moon rise almost simultaneously, as if by prior arrangement. Kodaikanal is known for its beautiful churches. The carnival at Mother Salette Church is unique and very popular. Thousands flock to attend the nine-day festival in August. Like Ooty, Summer Festival is also held in Kodaikanal every year in May. Boat races, flower and fruit shows, cultural programmes are held during the festival. Visit the Shembaganur Museum of Natural History to watch the marvel of orchids in bloom. The museum has over 300 exotic orchid species. It also houses an impressive taxidermy collection.